A collection of essays collated by Catch22 and the National Children’s Bureau (NCB) exploring new perspectives on how to do better for vulnerable children. Catch22 and the National Children’s Bureau (NCB) have brought together influential figures – from government advisers, local authorities, academia and leading voluntary sector organisations – to contribute to a collection of essays, exploring new perspectives on how to do better for children and families across the country. 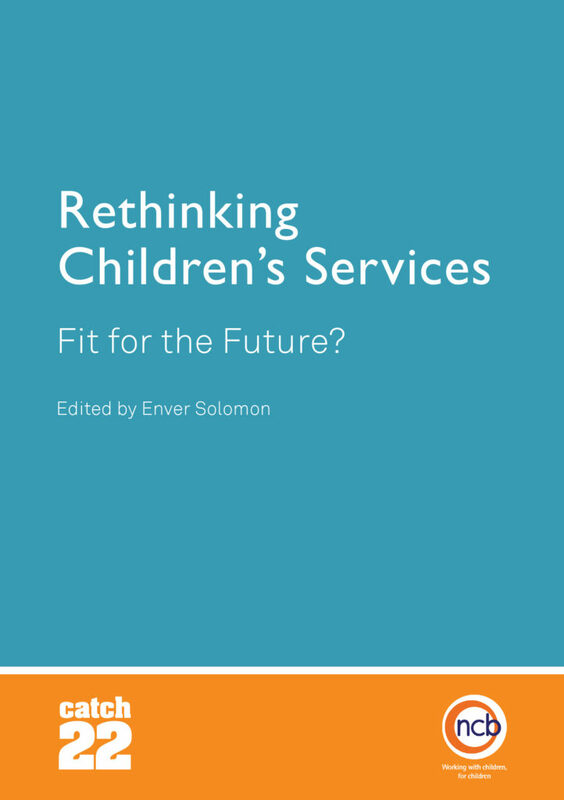 Edited by NCB’s Enver Solomon, ‘Rethinking Children’s Services: Fit for the Future?’ promotes fresh thinking and practical ideas as children’s services struggle against a backdrop of tightened budgets, increasing demand and mixed outcomes. Political and public scrutiny is at an all time high, with vulnerable children at the forefront of the policy agenda and public consciousness. The watchwords for the new normal of shrinking public budgets must be innovation, technology, partnerships, localism and outcomes, not processes argues Lord Warner. Lisa Harker argues that unleashing the hidden resources of the community will have a much more powerful impact on the lives of children than could ever be achieved through the deployment of statutory services. Professor Forrester argues that despite many attempts to restructure, reorganise and reform children’s social care services, little has been achieved. Before we find a solution, we must reconsider the reasons that children’s services exist. Simply reducing or reconfiguring services will not bring about sufficient improvements in the quality of children’s social care. Martin Pratt argues for an act of collective imagination in a community, locality or area. Wigan Council is committed to a whole life approach. Donna Hall explores the benefits of Wigan’s Start Well integrated delivery model; a three year programme underpinned by innovation and creativity. Chris Wright argues for less bureaucratic, more efficient and more human ways to deliver services for children and families. By refocusing priorities on relationships rather than bureaucracy, he predicts improved outcomes and lowered costs. Martin Narey argues that the challenges facing children’s services in the next few years, not least financial, will mean that social workers will need to be increasingly effective if vulnerable and abused children are to be adequately protected. Louise Casey draws on her experience reporting on Rotherham Metropolitan Borough Council and its failings over child sexual exploitation. She argues that ‘child sexual exploitation and our response to it, holds up a mirror to the inadequacy of our ‘corporate parenting’. Michael Little argues for a shift towards relational social policy, citing three compelling catalysts for change: faux austerity; the exhaustion of the outcome paradigm; and the gap between service and need. Kathy Evans argues that the idea of a ‘mixed economy’ of public, voluntary and private organisations in children’s services is nothing new, but ‘outsourcing and competition are part of the problematic past that we must move away from’.